For traveling to/from hotels, entertaining spots and airports in the tri-state area or on the Long Island, it is always wise to book with a Quogue limo service provider who cares for your safety as well as comfort. While coming home from a family vacation or business travel, the first thing you need is someone to pick you up from the airport without hassle or delay. Your frustration is likely to build up over the time looking for the right transportation service as most of the Quogue car services outside the airport may even ask for unexpectedly high rates. However, there are some premier Quogue limo service providers offering the best prices for the car service to the airport or your home at any hour of the day. No matter you plan for a romantic date, night out on the town or a tour to any local concert or game, the Quogue limo service will be available with a professional driver to transfer you in style and with comfort. If you really take time to find a premier Quogue car service provider, the fleet along with the service standard can make a big difference to your traveling experience. Next time you are in an urgency to book for a limo service in Quogue, consider checking if it has the following qualities of a premier car service provider. One of the most convenient options you have these days is door-to-door limo service in Quogue, which allows you to get picked up/dropped off as close to the desired destination as possible. It will ensure you a stress-free traveling experience with little time wastage on a personal or professional trip. 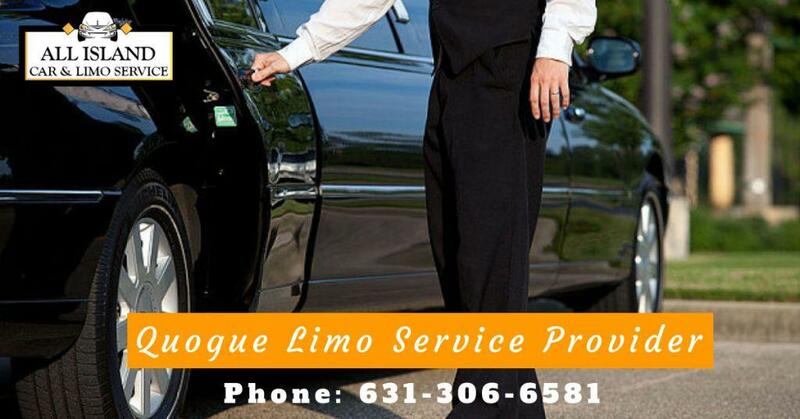 So, be sure about door to door transfer by the Quogue limo service provider to/from your home or office. It will let you enjoy timely arrival at the meeting, date or airport, leaving the concern of losing time, comfort etc. Be it is your airport ride, night out on the town, date or any other special celebration, you can make it unforgettable by booking with a premier limo service provider in Quogue. It will give you access to an incredible fleet of modern vehicles having all the latest features for your ultimate travel comfort. From stretch limos and Cadillac Escalades to Lincoln Towncar sedans and Mercedes sedans, you will have everything to make a perfect choice for your individual travel needs. With a team of professional drivers on call, you can expect a premier car service provider in Quogue to cater to your private or business transportation needs 24/7. It is available round the clock to respond to your call for airport ride or city transfer safe and fast. For every premier Quogue car service provider, customer satisfaction comes first. It mainly offers discounted rates to repeat customers and all those having a high frequency of travel bookings. Thus, you can be sure of reaching at your destination safely and on time, while enjoying every comfort that is possible in a latest model vehicle. Most of the premier Quogue car service providers offer a quick and affordable quote so that you can avail the best quality transportation to/from hotel, airport, parties and special events. There is also the guarantee timely pick up/drop off, free airport Meet and Greet, and the latest vehicle fleets for your choice. You can book it online or over the phone to get delivered with an affordable quote as soon as possible. Why not book your Quogue limo service with All Island and Car Service the next time and make your experience beyond enjoyable? We have all the above qualities that prove us a premier Quogue car service provider in every sense. Our Quogue car service can be tailored to leave you with an amazingly memorable experience to cherish forever. Call us at (631) 306- 6581 or mail us at Info@allislandlimo.com for making a reservation right now! Why would one need to rent airport car services in all Long Island area?